Preheat the oven to 450 degrees F and place a baking pan on the middle rack. Heat a stove top grill over high heat. Cut a strip off either side of the eggplant to expose the flesh. Cut into 4 thick slices parallel to the cut sides. Combine the almond or olive oil with 1 teaspoon of the toasted sesame oil in a small bowl. 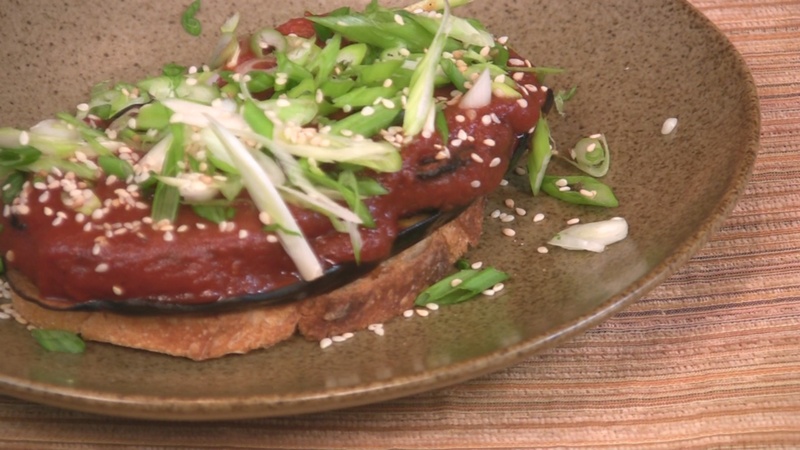 Brush the eggplant slices very lightly with about half the oil, and spread them out on a plate or tray. Sprinkle the slices on both sides with the salt, and then place them on the grill. Cook for about 5 minutes on each side, and then place the slices in the baking pan in the oven. Keep the grill hot. Combine the tomato puree, hoisin sauce, agave nectar and the remaining toasted sesame oil in a small saucepan over medium heat. Toss the seitan slices with the remaining oil and place them on the grill. Cook for about 3 minutes on each side, and then add to the sauce. Stir well and then lower the heat to keep the sauce and seitan hot, but not bubbling. Toast the bread slices and place one on each plate. Remove the eggplant from the oven and place one slice on each piece of toast. Divide the hot seitan and sauce among the 4 slices, covering nicely. Sprinkle with the scallions and sesame seeds. Serve at once.